The new iOS 7 is exactly the sort of thing that makes being an app developer so thrilling. We’ve spent months getting to know every minute detail, design and interaction of the new operating system. The experience has been eye-opening, inspiring and freeing. IOS 7 is so new that it allowed us to let go, restart and build in a way that we haven’t been able to do in years. The result: a completely, unbelievably, unexpectedly new Evernote. The notes section now displays your last two notes for quick access, and the Quicknote feature is right on the home screen, letting you start a new note, take a picture, or create a new reminder or task list. Once the note editor opens, you’ll be able to start typing right away, as the cursor now goes right to the body of the note. Premium users will be able to markup their images and PDFs within the Evernote app, and free users will get to try this cool feature out for 30 days. The Notebook view now combines both personal and business notebooks, and will let you subscribe to or get emails for Reminders. The tag screen has a new look, with popular tags darkened for easy identification, and you can now share notes via AirDrop, which seems like a fantastically useful feature in an office setting. No more sharing notes with co-workers who forget to check their email! Evernote has always been a go-to app to keep notes and such connected and synched, and now here are even more reasons to use it. 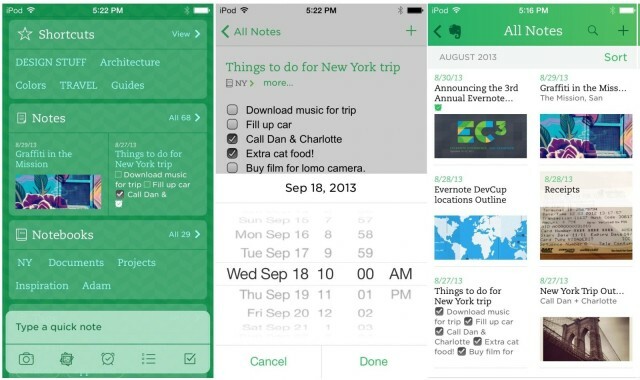 Evernote is a universal app and is currently available in the App Store. The update is free to all current users.